All FINAL SALE Clogs are in stock inventory priced to sell!!! All others are made to order and will require about one week from purchase. Hand woven clogs require 3-4 weeks and Hand painted clogs require 2 weeks. Sizing and fit are always a concern when purchasing footwear online. Please convo me with any size questions. PU Rubber based Comfort Sole can run a bit small but above sizing is good. HALF SIZES for the comfort base and the super high should size up. Medium heel and low can size down. stand on a piece of paper barefoot and trace very accurately the outline of your foot (both if there are differences in the two) and measure from middle of heel to longest toe. low heels are wider, so let me know your American shoe size or tracing length, and Ill help you with the proper size. Each clog is handmade and new. I weave the textiles from unique, reclaimed, and hand dyed yarns and upcylced textiles, and paint the bases custom or from your own designs... But satisfaction is guaranteed. If you are not satisfied with the fit of your shoes, please return them to me in the same condition you received them, and I will adjust them or make you a new pair that DOES fit. I will request tracings/measurements of your feet if it is a custom order. Chameleon Clogs accepts Money orders, CCards and Paypal!. I will ship priority mail postal service with insurance. My Company allows you to choose your base, style and colors. and any additional embellishments you desire in our collection. I do not make new shapes for the create a clog orders. Please refer to the 5 shapes I offer for creating your own color and look. A sandal, a mary jane, a single and wide strap sandal, and a full mule clog. I am happy to hear your ideas for custom work. I charge 50.00/ hour extra for this. I will not duplicate another clog companies designs, so please do not ask me to copy. I would not want them to copy my designs either. Sandal sale is good for one more week! Ends sept 7. Coupon code SANDALSALE for 20% off any open toed sandal. Back to school end of summer sale! Coupon code SANDALSALE for 20% off all my open toed sandals! Not good towards custom orders. bases imported from Sweden to provide my collection with superior engineering of their orthopedic footbeds. 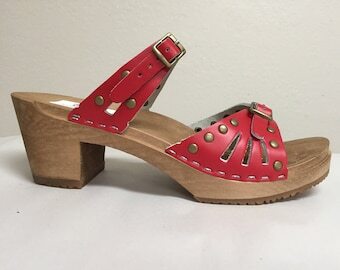 Creating Handmade Clogs and Sandals as Unique as You are! That year two women came into the center and requested a woven textile to use in their clog line. What a fun idea we all thought!!! I spent the next two years developing the cloth. Its weight, sett, density, materials to use and not use.. and Voila! Our first line of woven clogs were made for us by a cobbler in the Midwest. I want to make you happy with your new shoes! So please feel free to browse through my collection I have on Etsy. I hand make each pair, so custom color requests are not extra. I encourage it!! Please convo me with any questions you may have. even if you think its silly :) I can do wide or narrow designs for you. high insteps are no problem!!! Chameleon Clogs is a Unique wooden clog company that allows you, the customer, to design and choose your own components for your clogs to make them truely personalized. Offering 4 styles of base and many colors of wood or go wild with your imagination as paint and color turn your clogs into something beyond the ordinary shoe store variety. Hand woven uppers, hand painted bases, ribbon and silk embellishments and over 50 different colors and types of leather to choose from...... It can get addicting!